Every year, millions of people "go Greyhound" and take the bus for their travels. In fact, we wouldn't be surprised to find that more and more people prefer taking the bus over flying on planes. We certainly do. Buses offer larger, roomier seats, and provide much more comfort than planes, which shoehorn you into seats like the proverbial "sardine." Before going further, the buses that we are talking about on this page are the common-carrier type, owned by private businesses (the easiest examples to think of are Greyhound and Peter Pan Bus Lines on a national level, or more locally in Massachusetts, the Fung Wah Bus Co. and Plymouth-Brockton Bus Lines. Private charter buses are also included here.) If you need information about municipal bus accidents, (buses operated by a city or governmental authority such as the MBTA,) please click to our MBTA Bus Accidents Page. That page contains information about governmental liability for injuries suffered on public (city) transportation buses and trains. The page you are on now deals with business-owned buses. Even though bus travel is in general more comfortable and easier than airline travel, with bus travel comes the all-too-real possibility of bus accidents on the road. If this has happened to you, you will need the counsel of a skilled Massachusetts bus accident law firm. The bus accident lawyers at The Law Offices of William D. Kickham & Associates have the experience, expertise and resources to obtain the best legal results possible for you in this situation. Call us today for a FREE AND CONFIDENTIAL CONSULTATION,at Ph. : (781) 320-0062, or at Ph. : (617) 285-3600; or click here to email us. We will respond to you very rapidly. If you are too injured to travel, we can travel to you. Right now, you're probably feeling understandably confused about what to do in the aftermath of a serious accident like this. Click here to download a FREE copy of an article that we've prepared for people who have suffered any type of accident or personal injury in Massachusetts, "Top 10 Tips If You Have Suffered An Accident or Injury in Massachusetts." We created this article for accident and injury victims who need guidance about what to do and - just as importantly, what not to do - immediately after an accident. We think you'll find it quite useful, and will be happy to answer any questions that you may have after reading it. Call our offices at Ph. : (781) 320-0062, or at Ph. : (617) 285-3600; or click here to email us, and we can begin to help you. Even in some cases, driver intoxication. Of these reasons, however, the majority of Massachusetts bus crashes result from operator error and a failure by the bus company to maintain its buses properly. Privately-owned and operated buses are considered common carriers. Because of that distinction, they are held to a heightened liability standard. Thus, if you are injured because of the negligence of a bus operator, or due to the bus company's failure to maintain its vehicles in a safe condition, the bus company can be liable for your injuries. Furthermore, all bus companies need to properly maintain their vehicles and to also document their maintenance work. What About Bus Drivers - Are They Held to Special Standards? Bus companies have a duty to make sure that their bus drivers are properly trained, and assure that they know how to properly handle any situation that can arise in the operation of the bus. In addition to adequate training, bus companies have a responsibility to make sure that their drivers have enough sleep and rest between shifts, so that they do not become excessively tired from too many driving hours on the road. Bus drivers have a particular responsibility for the safety of bus passengers, to keep their attention focused on the road, and to follow safety guidelines, even when they get behind in scheduling. Obviously, bus drivers should never, under any circumstances, engage in activities that might distract them from their operation of the bus - these activities include talking on cell phones and texting while driving. If and when bus companies and their individual drivers fail to carry out these responsibilities, it is considered negligence on the part of the bus company. all these events can lead to serious personal injuries suffered by the bus passengers, even fatal injuries. The types of injuries can include head trauma, brain damage, lacerations, broken bones and internal injuries. These serious injuries can all too easily prevent accident victims from returning to work, and prevent them from ever feeling physically 'normal' again. Many such victims suffer debilitating emotional trauma, in addition to their physical pain and suffering. 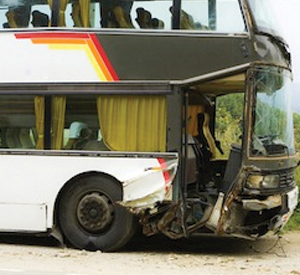 Who is Liable for Damages an a Bus Accident? Regardless of whether the bus driver caused the accident due to faulty operation, or the accident was due to equipment failure, the bus company would almost certainly be the first defendant named in a lawsuit for damages. In addition to the bus company itself, additional defendants may include any business who might have leased the bus. Depending on the facts, it may also be that other defendants may be involved, such as the company that designed and engineered the bus; the company that manufactured the bus, tire manufacturers, or tour operators and charter companies, if relevant. Importantly, no how many defendants are named in this kind of a lawsuit, the fact is that all such defendants would almost certainly carry liability insurance capable of compensating bus accident victims for their injuries. That's the good news. The bad news is that each of those liability insurance companies would be represented by insurance company defense lawyers - and these lawyers fight very hard to prevent bus injury victims from receiving adequate compensation for their injuries. To successfully receive just and adequate compensation for injuries suffered in a bus accident, you need a very experienced Massachusetts bus accident injury law firm on your side. Do not hire a law firm that does not have proven experience in this field of law - this area of legal practice is very complicated, and if your lawyer makes even a minor mistake, it will probably hurt your case a great deal. If you've been injured in a Massachusetts bus accident, make the best choice you can and contact our experienced Massachusetts bus accident attorneys. The Law Offices of William D. Kickham & Associates offers FREE consultations, "house calls" to your home or hospital, and most importantly, you will pay NO LEGAL FEES to us unless we win your case for you. Call our office now at Ph. : (781) 320-0062 or at (617) 285-3600. Or you can click here to send us a confidential email. We promise to reply quickly, answering all your questions, and we'll let you know what your strongest legal options are. We can protect your legal interests and obtain the highest amount of compensation possible under the specific circumstances of your case. All Massachusetts bus accident cases are governed by a statute of limitations, which means that you must file suit with a specific period of time, so don't wait to contact us. The Law Offices of William D. Kickham & Associates has the experience, expertise and resources to obtain the best legal results possible for you. You might recognize Attorney Kickham's name from seeing him interviewed on television or in newspapers. These news organizations include, among others, Court TV (now In Session on HLN,) Fox News TV-25/Boston, The Boston Herald, WBZ-AM Radio 1030, WCVB-TV5/Boston, Nightside With Dan Rea, Greater Boston With Emily Rooney, Money Matters Radio/Boston, and The Metro Newspaper/Boston. The news media calls Attorney William D. Kickham because they know he is an expert on the subject of Massachusetts personal injury law, including Massachusetts bus accidents. Put that expertise and experience to work for you, by calling our offices at Ph. : (781) 320-0062 or at (617) 285-3600. Or click here to send us a confidential email.